The B-side of Dancing In Your Eyes, the fourth of five singles on the Go! label 1965-66 by Billy Adams (William Tregonning), former lead singer of Melbourne band The Checkmates and a regular on The Go!! Show. Adams's version of Buddy Knox's I Think I'm Gonna Kill Myself was a minor hit in Melbourne (1965, #49) and Dancing In Your Eyes charted in Brisbane (#24) and Perth (#37). He had recorded another Eddie Quinteros song in 1965, Slow Down Sandy. Thanks to Terry Stacey for suggestion and initial research. Single on New York label Brent, a subsidiary of Bob Shad's independent Time label. 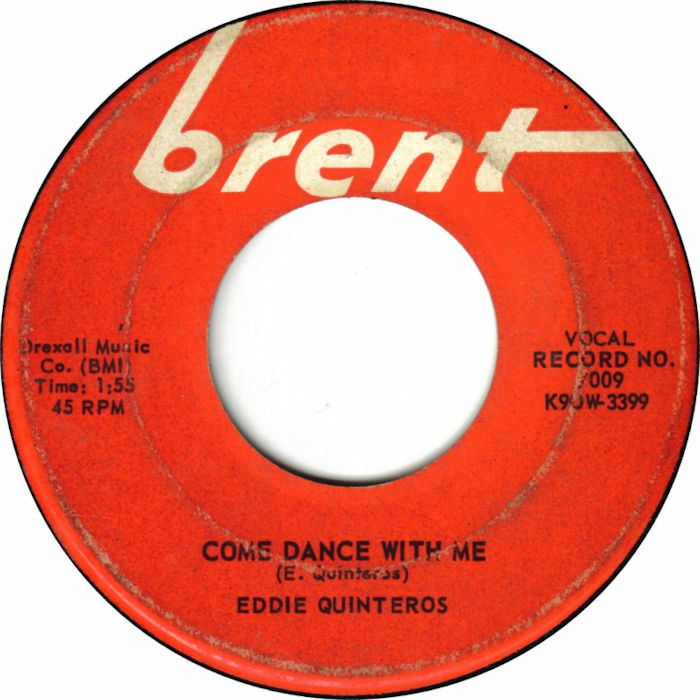 San Francisco-born Eddie Quinteros released six singles 1960-61: three on Brent, one each on Del-Fi and M & K, and a re-release on Ed-Dar. 1. Label shot at Rockin' Country Style. See also, at that site, details of Eddie Quinteros releases (some with audio and label shots) and Brent label discography. 2. Label owner Bob Shad at Wikipedia. Same title but not the same song as "Come Dance With Me" by Billy Adams. Opening track on Sinatra's LP Come Dance With Me. Often recorded, notably by jazz pianist Oscar Peterson on A Jazz Portrait Of Frank Sinatra (1959). Red herrings! BMI was listing 74 song titles for Come Dance With Me at the time of writing. Single on Festival by Melbourne rock'n'roll band that included future Daddy Cool bassist Wayne Duncan on bass. A founding member was vocalist Shane Harley, a stage name of Noel McGrath, later known as a writer and broadcaster, perhaps best known for his Australian Encyclopaedia of Rock (1978). All Stars saxophonist Graham Bloomfield and drummer Mick Lynch were later in The Allstars, formed 1983 and active into the 90s. Disambiguation: Neither of these bands was John Paul Young's backing band, also The Allstars, formed in the 70s. Nor were they... On second thoughts, we'll pass on the opportunity to list every band in the history of music that used the name All Stars or Allstars. Reference: Chris Spencer et al, Who's Who of Australian Rock, 2002 edition. Thanks to Terry Stacey for the Noel McGrath connection.